For other uses, see Undead (disambiguation). 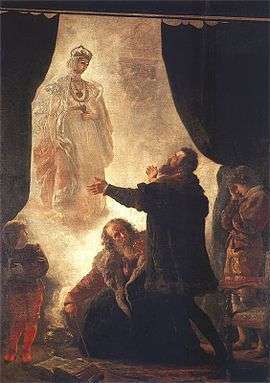 The ghost of Barbara Radziwiłł by Wojciech Gerson: ghosts are a common form of the undead in folklore. The undead are beings in mythology, legend, or fiction that are deceased but behave as if alive. A common example of an undead being is a corpse re-animated by supernatural forces, by the application of the deceased's own life force, or that of another being (such as a demon). The undead may be incorporeal like ghosts, or corporeal like vampires and zombies. The undead are featured in the belief systems of most cultures, and appear in many works of fantasy and horror fiction. The term is also occasionally used for putative non-supernatural cases of re-animation, from early experiments like Robert E. Cornish's to future sciences such as cryonics and chemical brain preservation. Bram Stoker considered using the title The Un-Dead for his novel Dracula (1897), and use of the term in the novel is mostly responsible for the modern sense of the word. The word does appear in English before Stoker but with the more literal sense of "alive" or "not dead", for which citations can be found in the Oxford English Dictionary. In one passage, nosferatu is given as an "Eastern European" synonym for "un-dead". Stoker's use of the term refers only to vampires, and the extension to other types of supernatural beings arose later. Most commonly, it is now taken to refer to supernatural beings which had at one time been alive and continue to display some aspects of life after death, but the usage is highly variable. Frankenstein by Mary Shelley is a seminal text in 19th-century discourse about the creation of life. Published in 1818, it was based on a number of sources, including Ovid's myth of Prometheus (indeed, the novel is subtitled "The Modern Prometheus"), Milton's Paradise Lost, Coleridge's The Rime of the Ancient Mariner, and William Beckford's Gothic novel Vathek. Shelley also drew on European folklore, such as the medieval Jewish legend of the golem, and German, Czech and Moravian ghost stories featuring vengeful dead (many of whom have characteristics of vampires rather than zombies). ‘Before we do any-thing, let me tell you this. It is out of the lore and experience of the ancients and of all those who have studied the powers of the UnDead. When they become such, there comes with the change the curse of immortality. They cannot die, but must go on age after age adding new victims and multiply-ing the evils of the world. For all that die from the preying of the Undead become themselves Undead, and prey on their kind. And so the circle goes on ever widening, like as the ripples from a stone thrown in the water... But of the most blessed of all, when this now UnDead be made to rest as true dead, then the soul of the poor lady whom we love shall again be free. Instead of working wickedness by night and growing more debased in the assimilating of it by day, she shall take her place with the other Angels. So that, my friend, it will be a blessed hand for her that shall strike the blow that sets her free. Later notable 19th-century stories about the avenging undead included Ambrose Bierce's The Death of Halpin Frayser, and various Gothic Romanticism tales by Edgar Allan Poe. Though their works could not be properly considered zombie fiction, the supernatural tales of Bierce and Poe would prove influential on later writers such as H. P. Lovecraft, by Lovecraft's own admission. In the Harry Potter series, Lord Voldemort uses reanimated dead bodies that are placed under his control by his dark magic powers as his guardians. They are known as Inferi. Wikimedia Commons has media related to Undead. Stoker, Bram (1975) . Leonard Wolf, ed. The Annotated Dracula. Crown. p. 193. ISBN 0-517-52017-6. ↑ "Can Such Things Be". Etext.virginia.edu. Archived from the original on 2003-02-16. Retrieved 2012-07-31. ↑ "Can Such Things Be". Etext.virginia.edu. Retrieved 2012-07-31. ↑ "SUPERNATURAL HORROR IN LITERATURE (1927, 1933 - 1935) by H.P. Lovecraft". Gaslight.mtroyal.ca. 1988-01-01. Retrieved 2012-07-31.